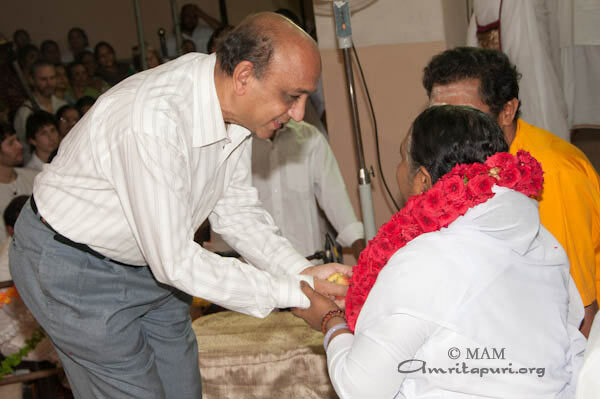 Amma paid her first visit to the city of Thanjavur and held a program at the Medical College grounds. 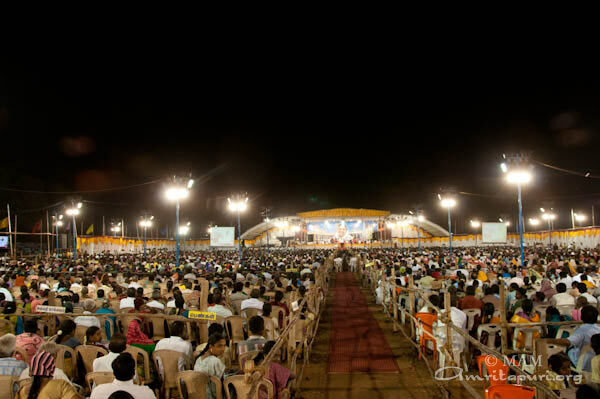 A massive crowd began to form from very early in the afternoon. 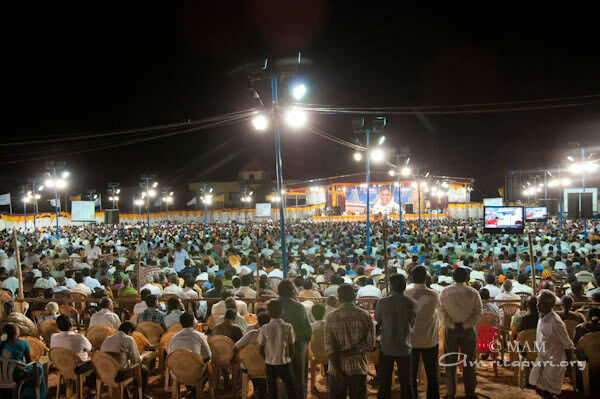 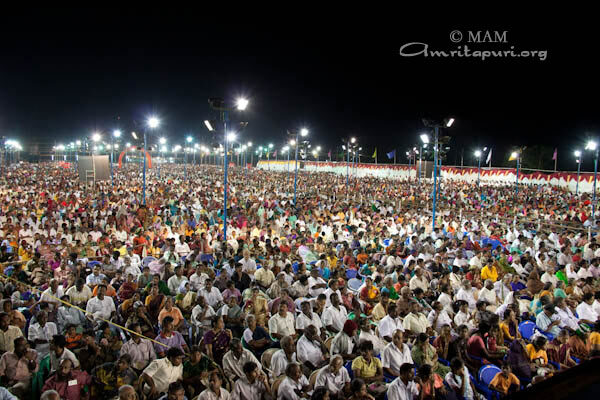 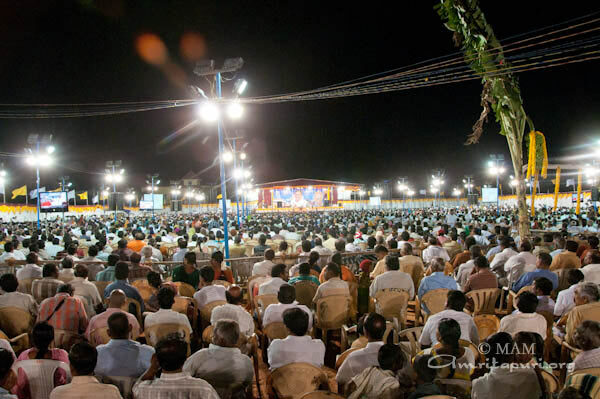 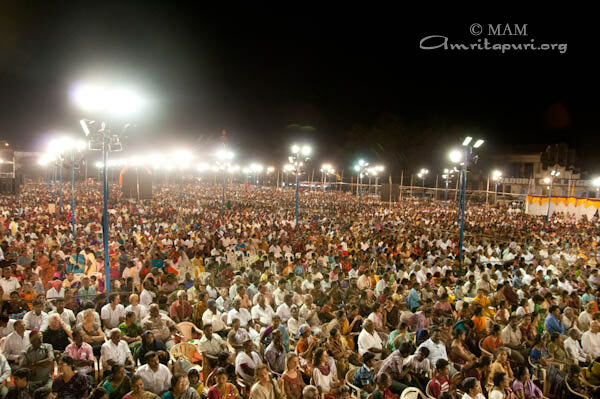 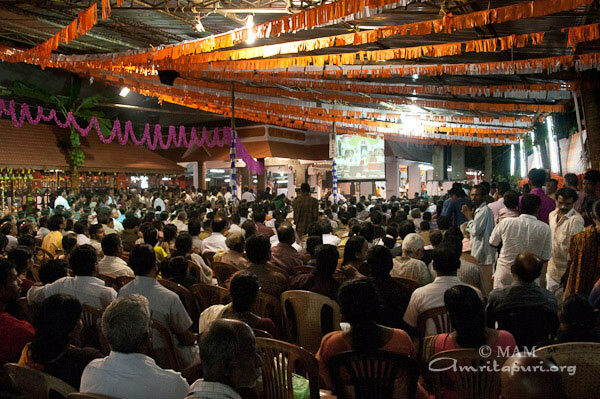 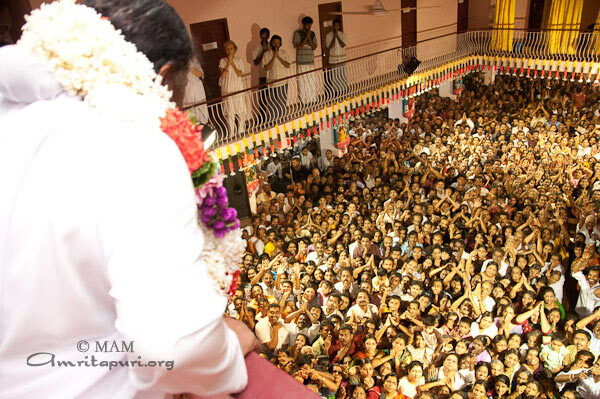 By the time Amma arrived in the evening the whole venue was overflowing. 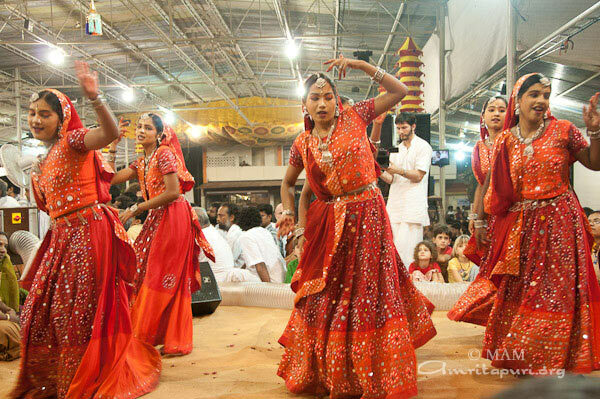 Thanjavur is the ancient capital of the Chola empire and is considered one of the historic cultural capitals of Tamil Nadu. 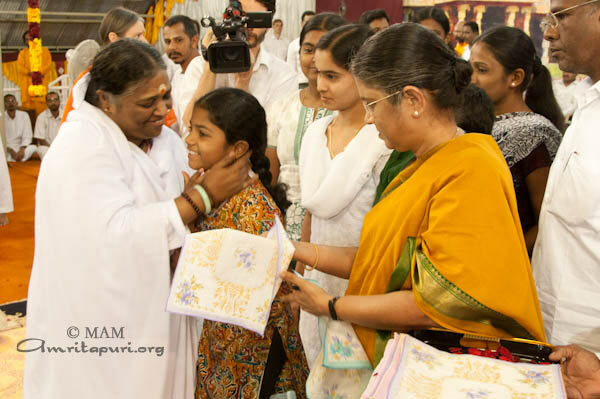 Amma launched a local chapter of the ABC initiative and handed over handkerchiefs to all students who came for darshan. 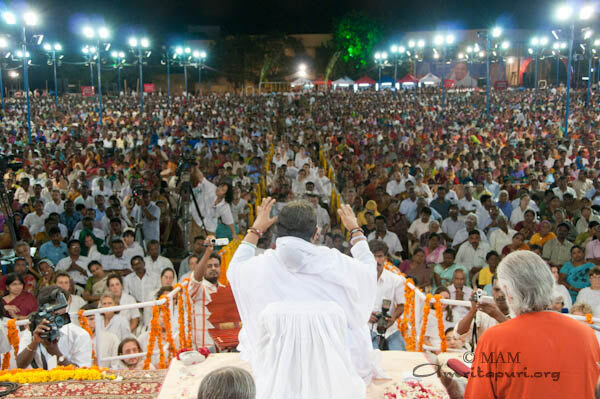 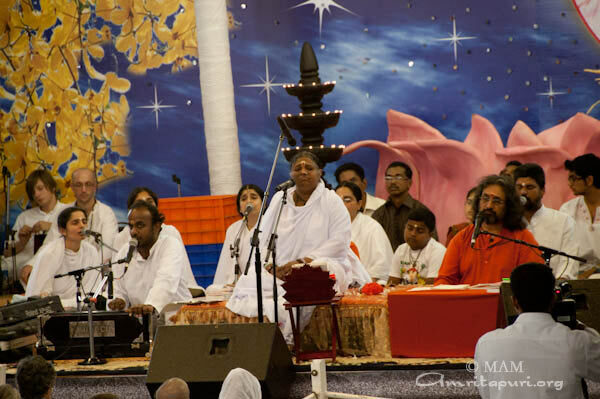 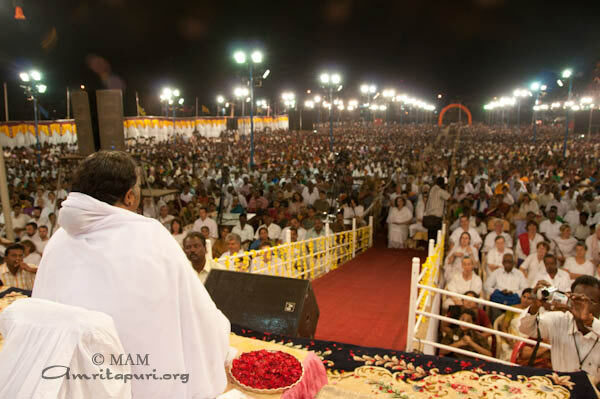 In her satsang Amma asked all those present not to spit or urinate in public and keep the environment clean. 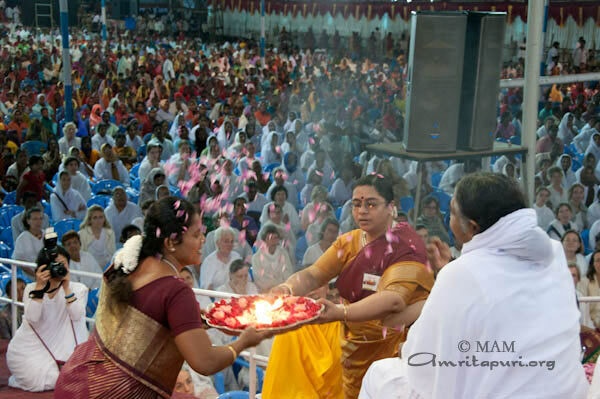 Amma led the manasa puja in Tamil and sang many bhajans in Tamil as well as Telugu. 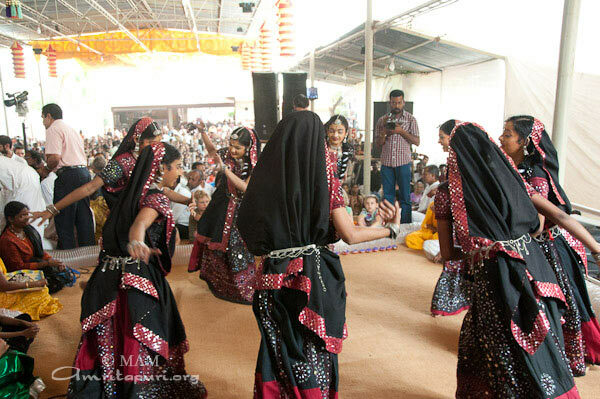 The city is also just inland from the coastal region of Nagapattinam that was devastated by the 2004 Tsunami. 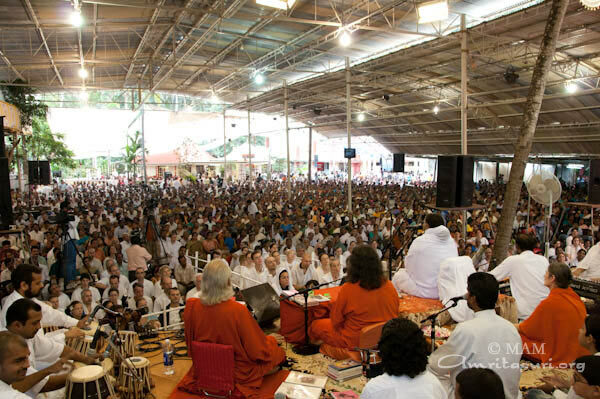 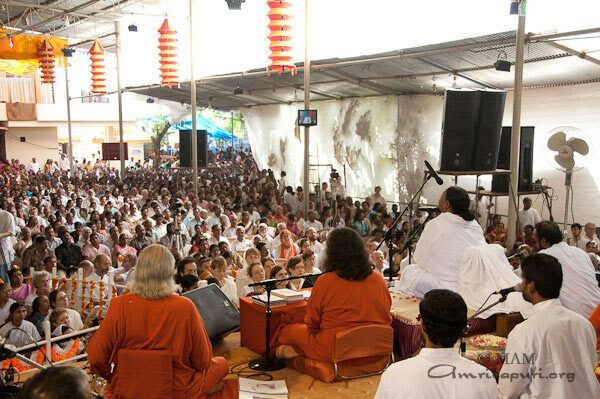 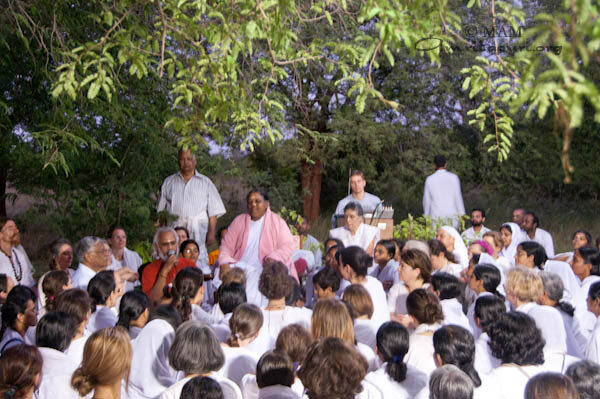 The ashram has rebuilt several villages and community centers in this area. 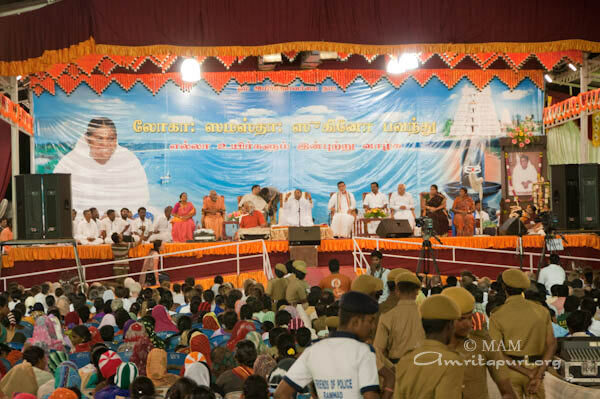 Many of the beneficiaries of the ashram’s relief work came to the program, eager to once again express their gratitude to Amma. 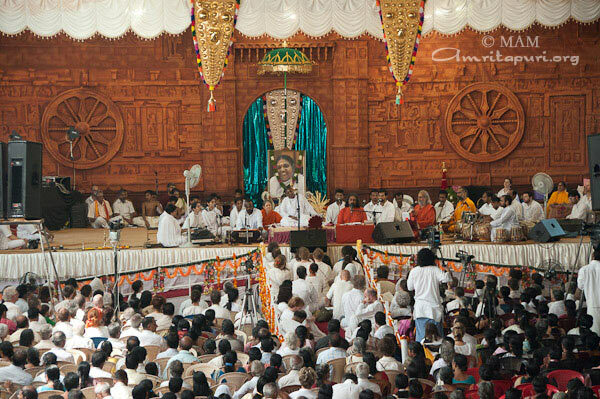 As darshan continued even after sunrise, tarpaulins and curtains were set up to protect the crowd from the increasing heat of the sun. 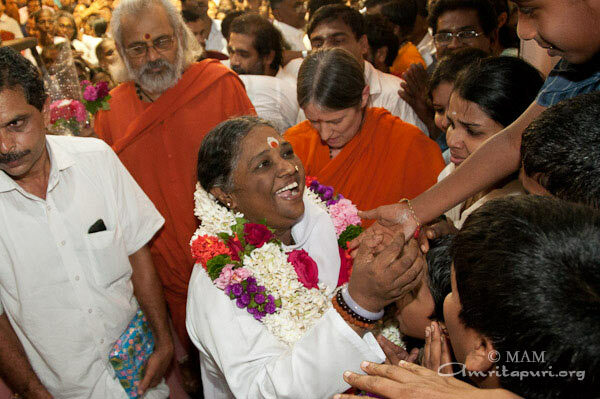 Amma announced in tamil that everyone still waiting for her darshan should gather in the shade. 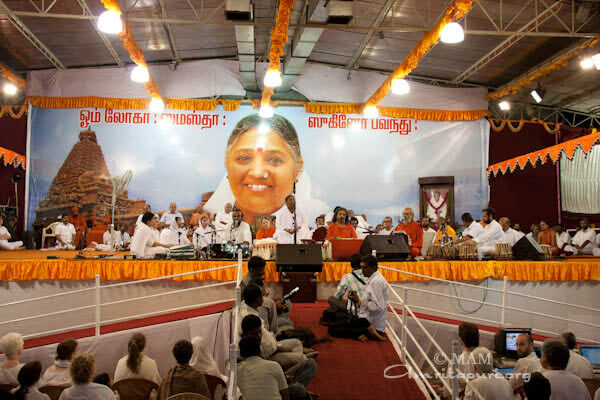 The program finally finished by 10.30 am, and Amma set to proceed for the next program in Kovai. 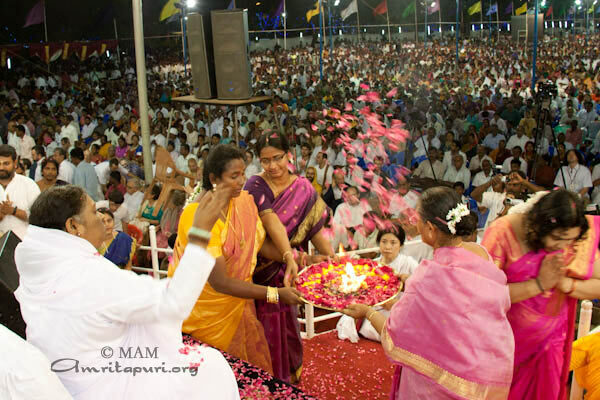 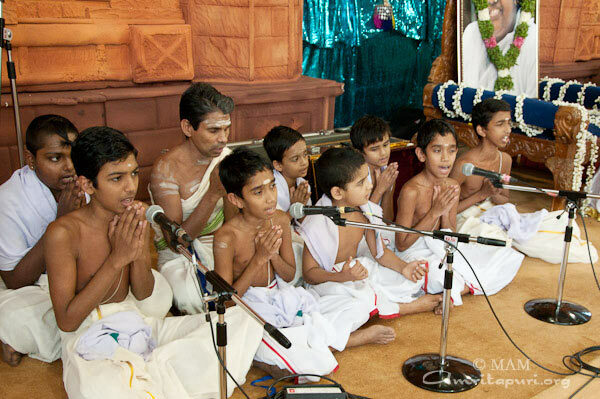 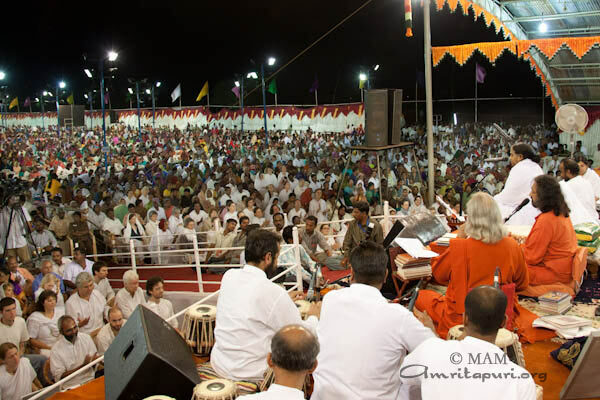 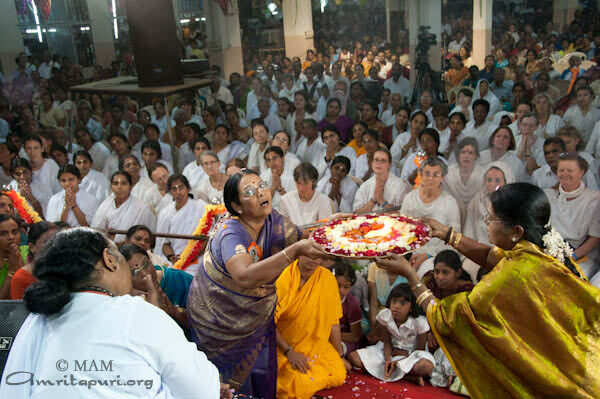 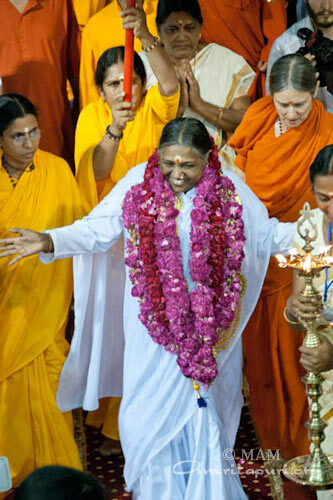 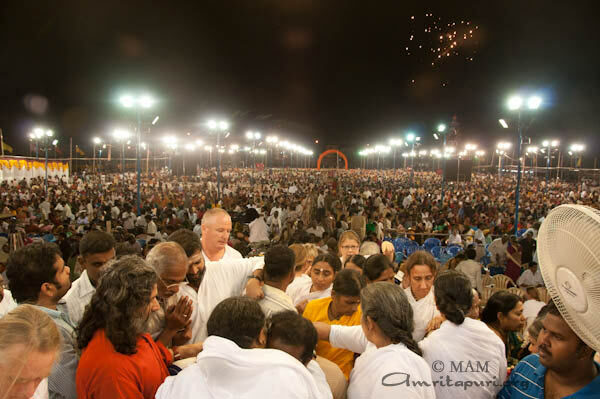 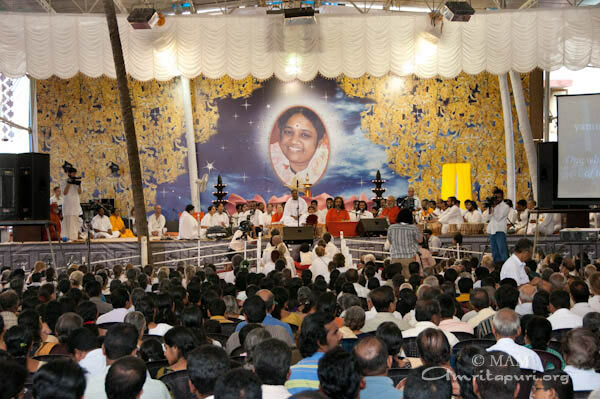 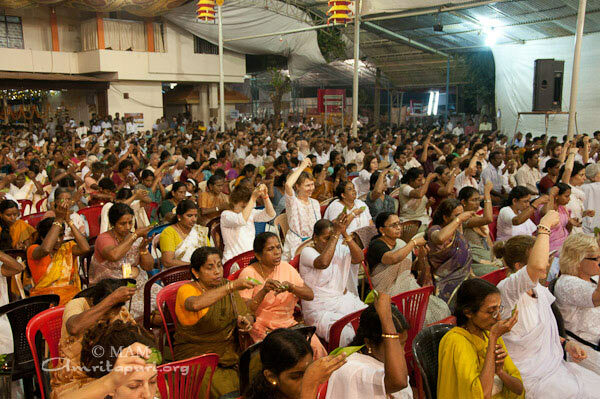 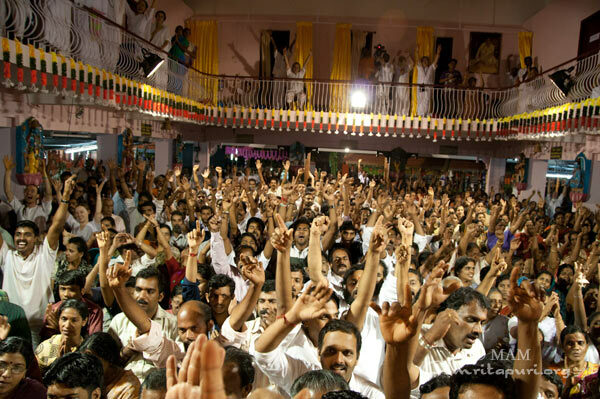 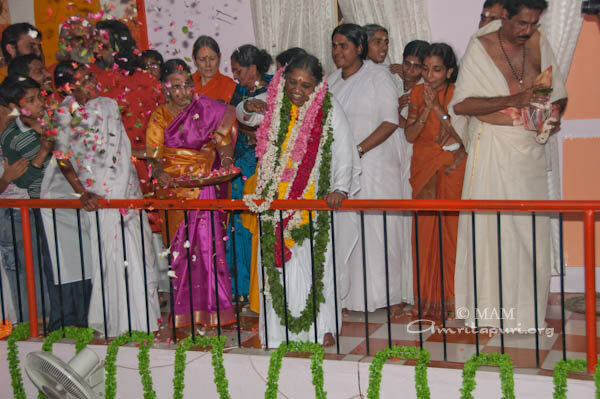 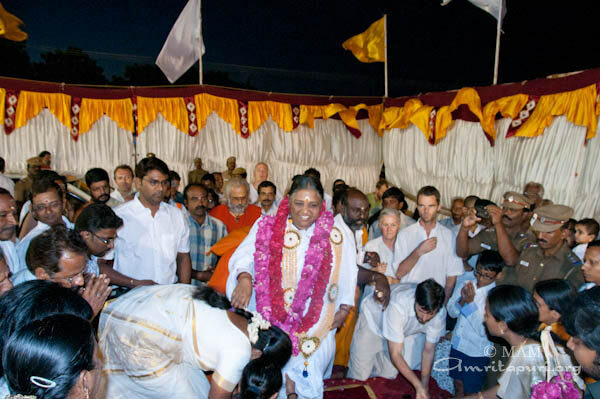 From 25 to 26 January 2011, Amma held Brahmastanam festival at Mata Amritanandamayi Math, Chennai. 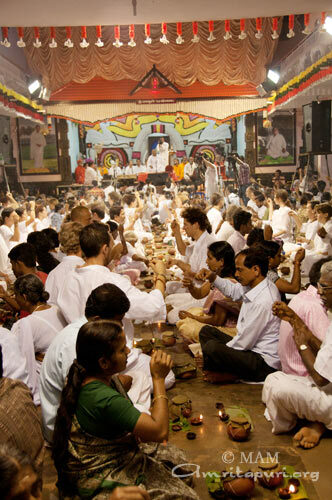 Chennai is the capital of Tamil Nadu and a hub for the south indian music, arts and film industry. 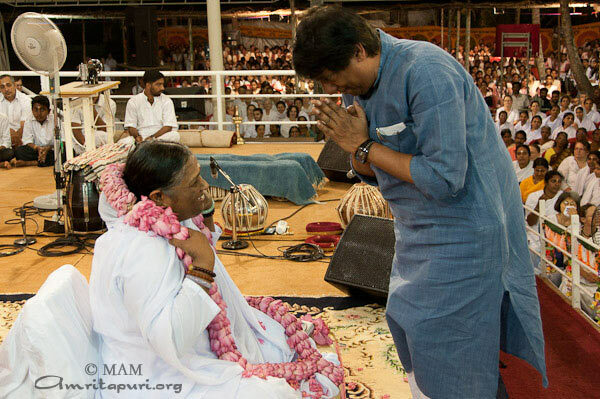 Therefore, several renowned musicians and film stars came to receive Amma’s darshan and perform for her. 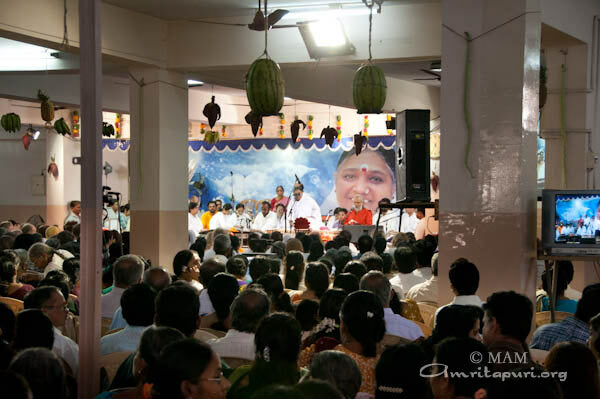 Amongst those who performed for Amma were Kunyakumari, Lalgudi Krishnan and classical singer Unnikrishnan. 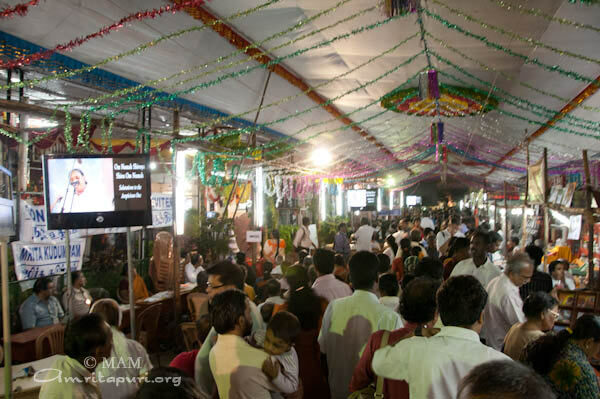 The devotees of Chennai are known for their creative ideas to decorate Amma’s program site. 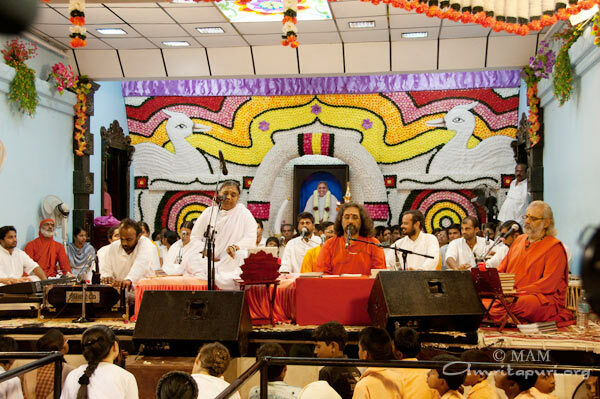 This year, fruits and vegetables were hung all along the ashram walls, giving a colorful and playful touch to the venue. 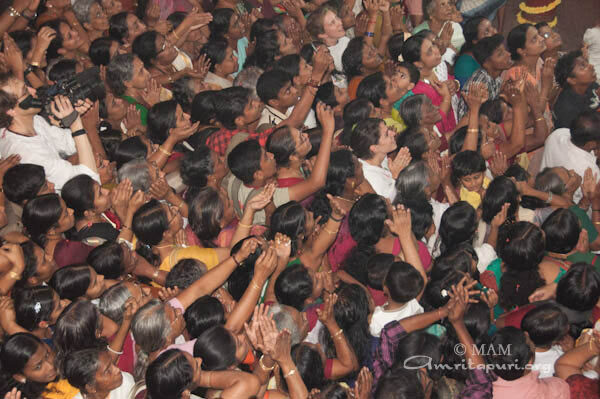 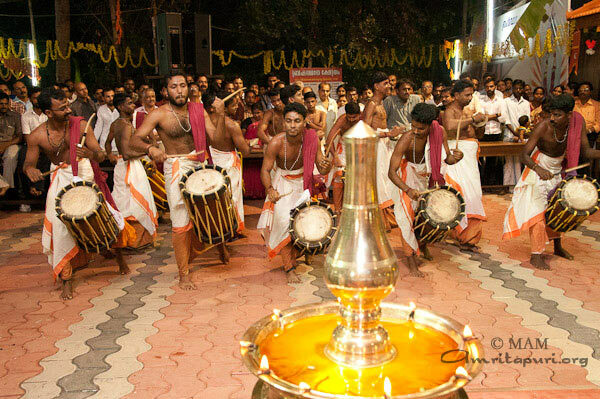 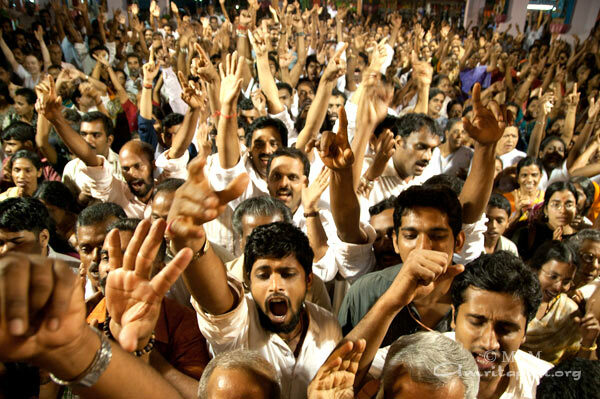 It was as if the devotees were welcoming Annapurneshwari – the goddess of food – into their city. 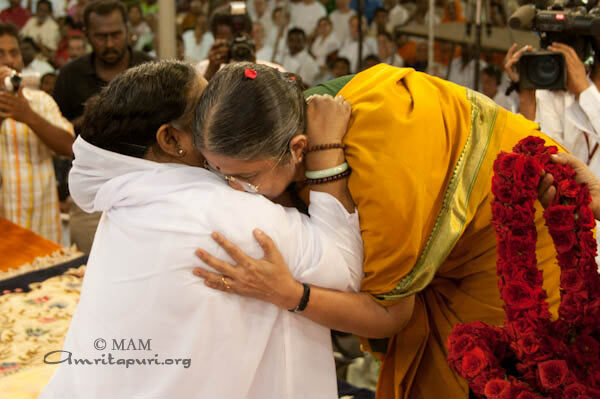 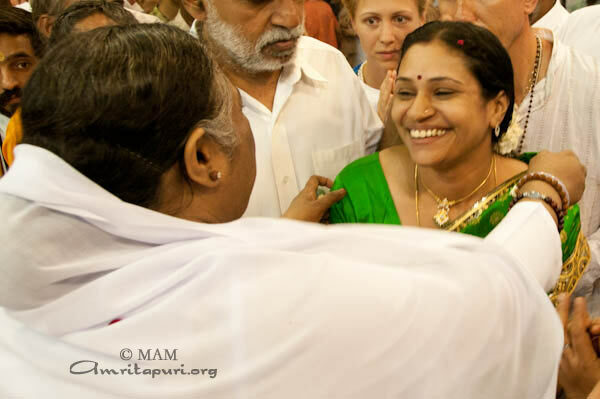 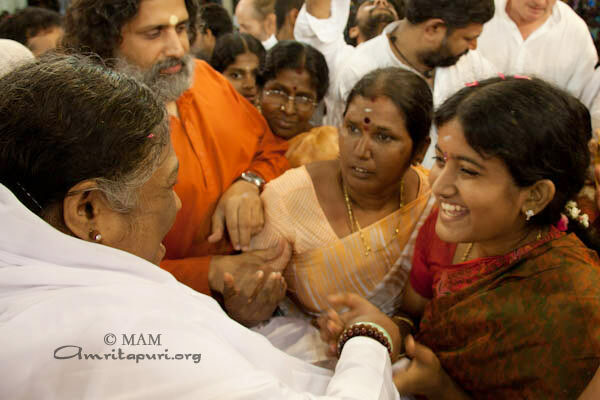 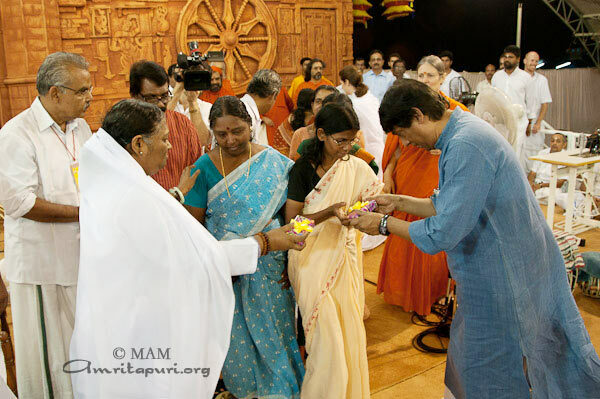 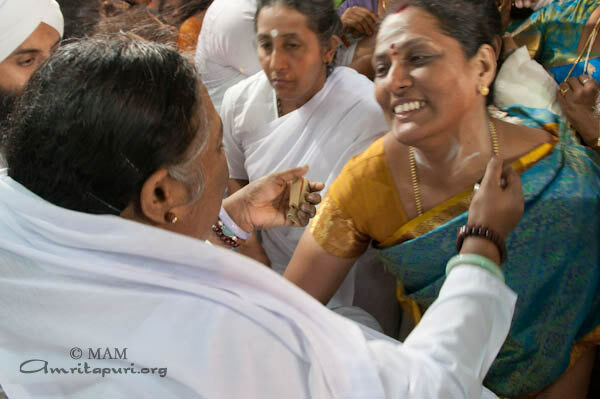 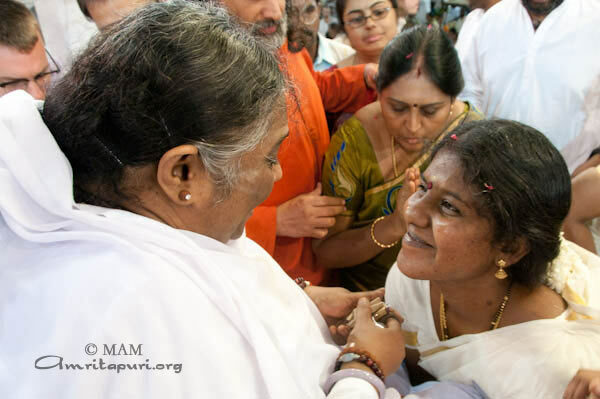 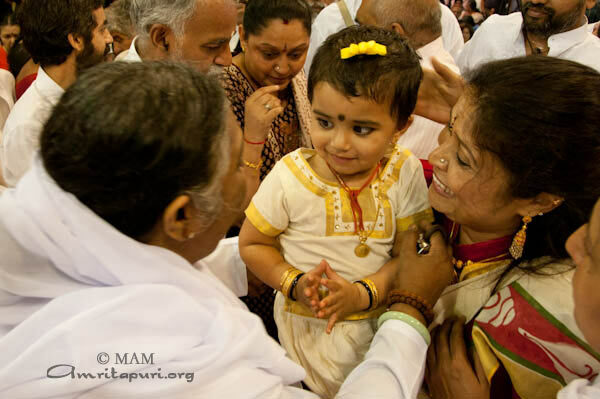 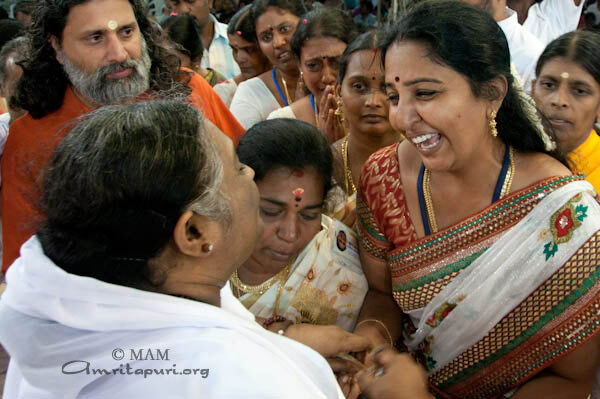 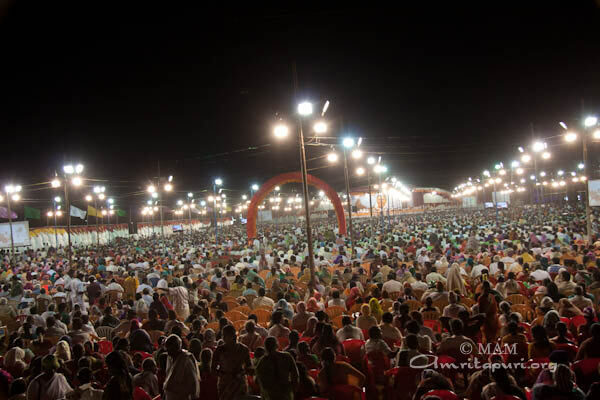 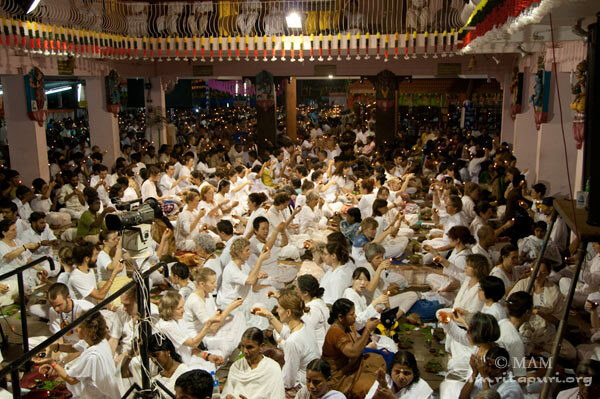 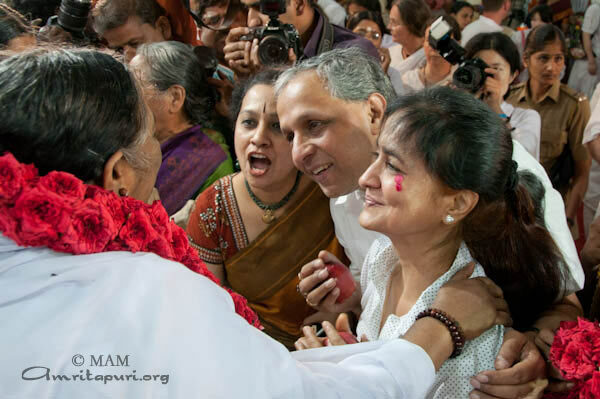 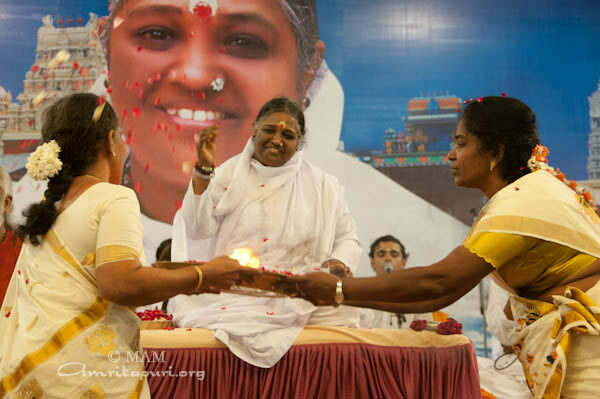 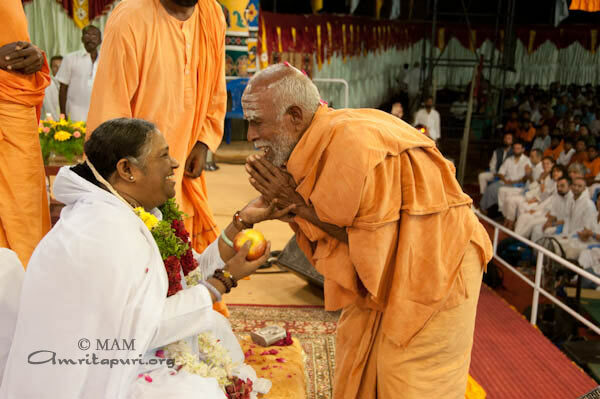 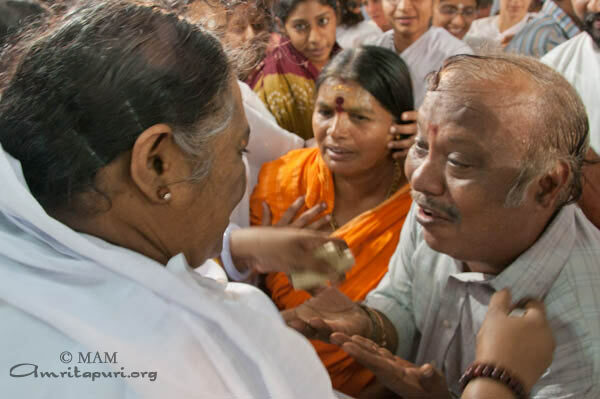 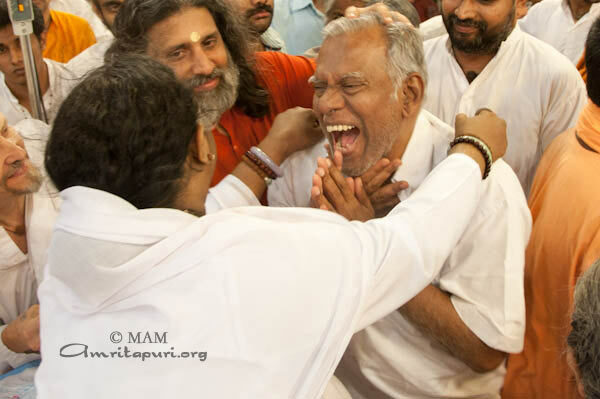 However, during the two days of festivals Amma did not only give free food for her children’s physical nourishment, but also provided everyone with the subtle food of her wisdom, love and motherly care. 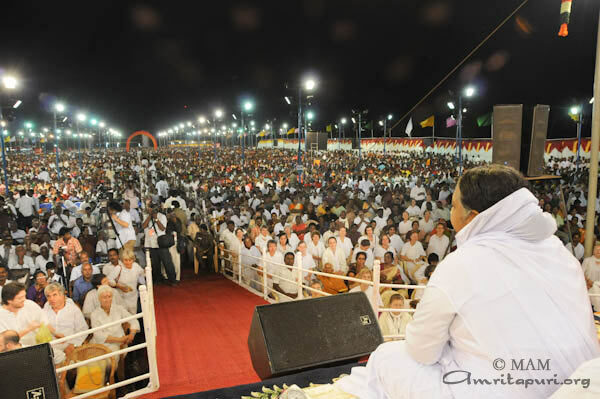 For the second time in two years, Amma visited Ramanathapuram for a public programme. 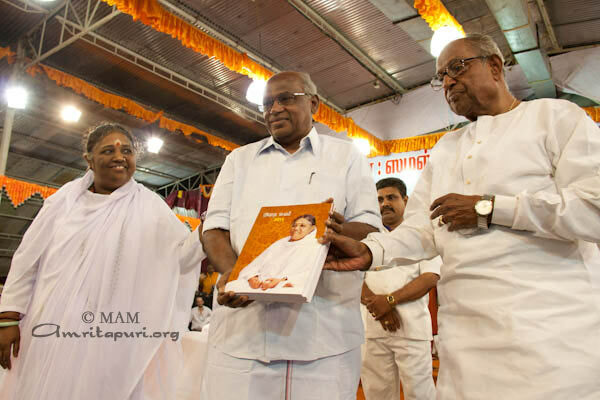 Amongst the dignitaries welcoming Amma were K Hasan Ali, MLA Ramanathapuram, Swami Parananda, vice president, Ramakrishna Tapovanam, Tirupraithurai and the raja of Ramanathapuram, Kumaran Sethupathy. 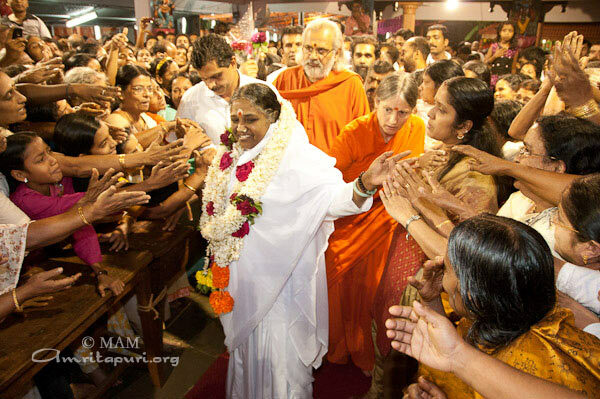 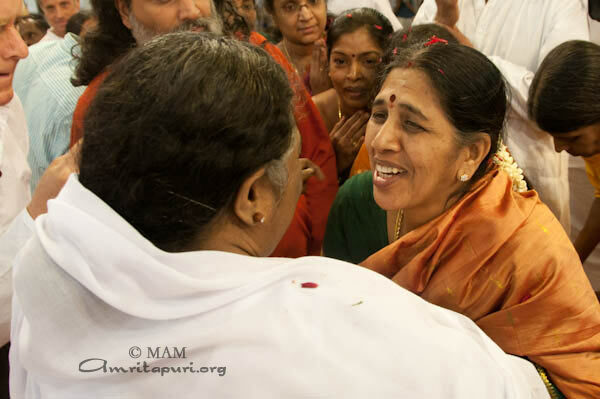 “Just after celebraing the Pongal festival Amma has come into our midst to double the joy. 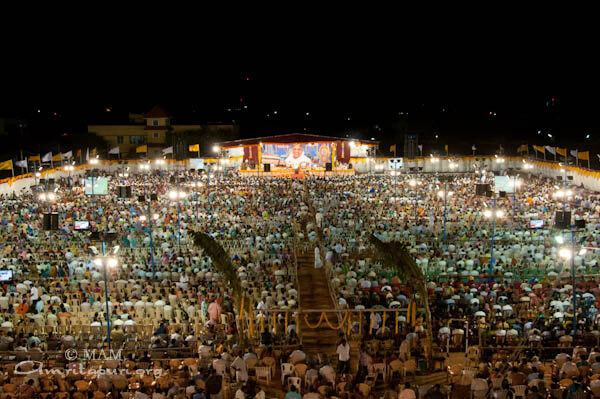 Since ancient times mahatmas and spiritual people like Swami Vivekananda and kings like Krishna Deva Rayar have visited Ramanathapuram. 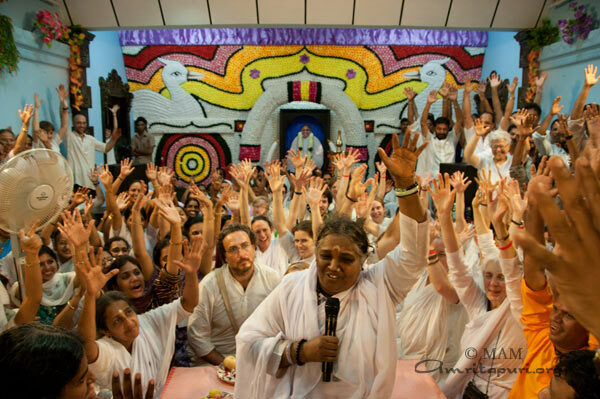 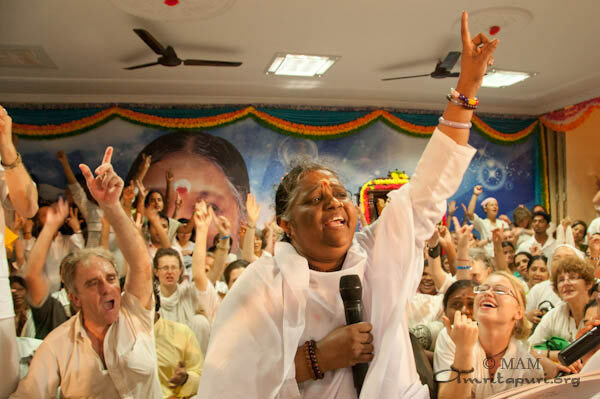 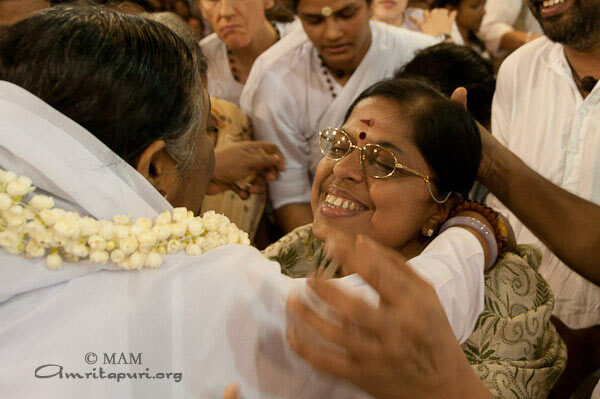 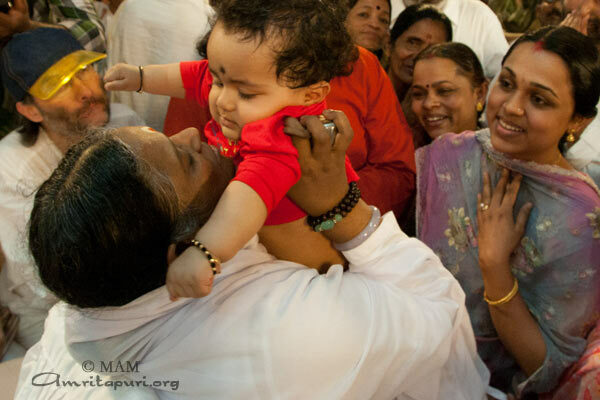 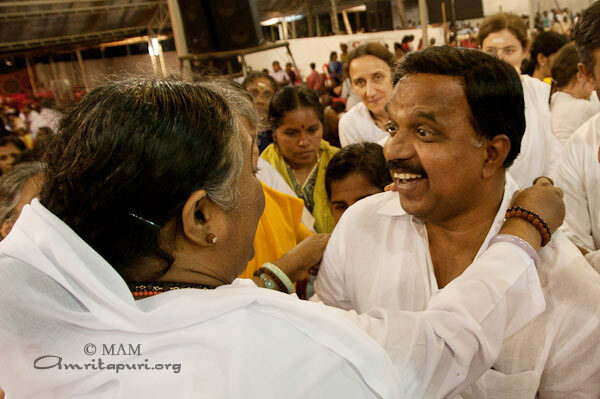 Now Amma has come here again, and just by looking at your faces I can tell how happy this has made you. 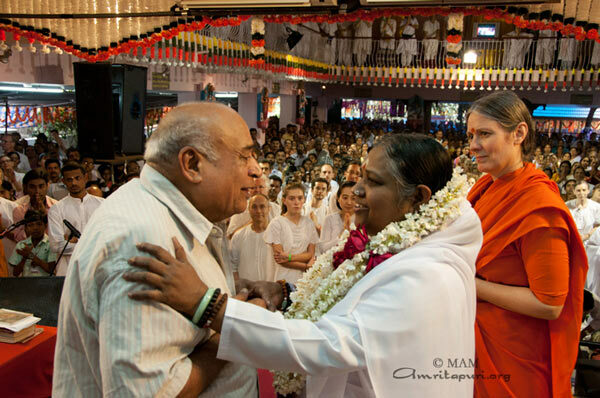 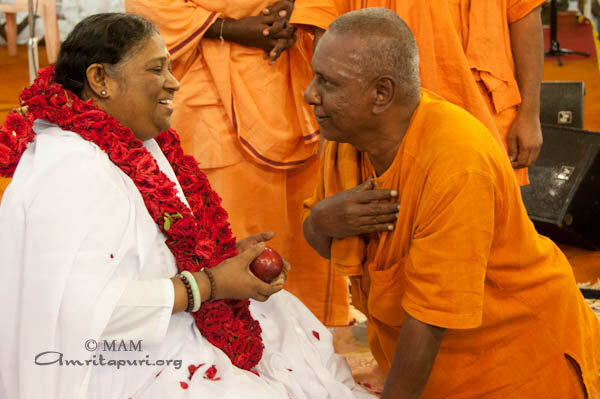 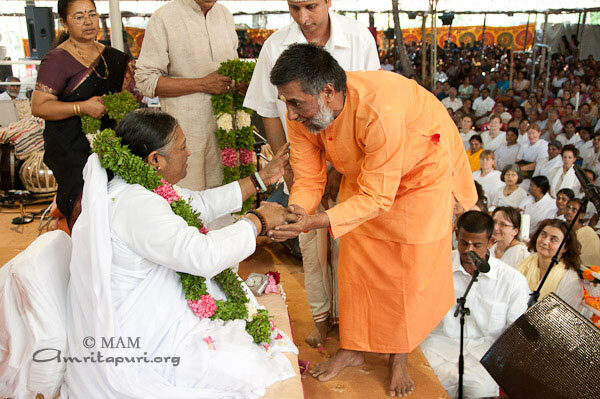 Why is Amma respected so much? 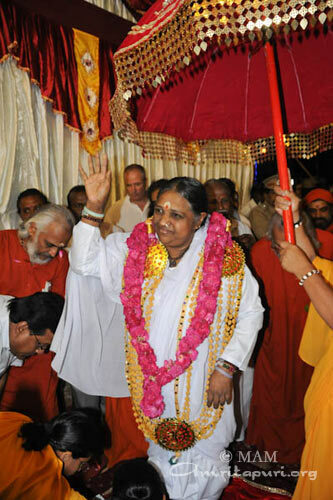 It is due to her dharma. 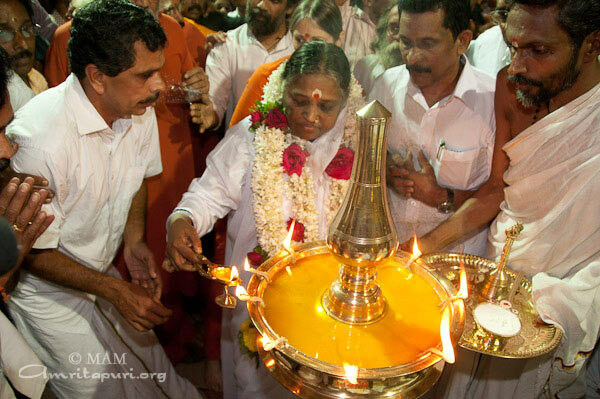 What is dharma? 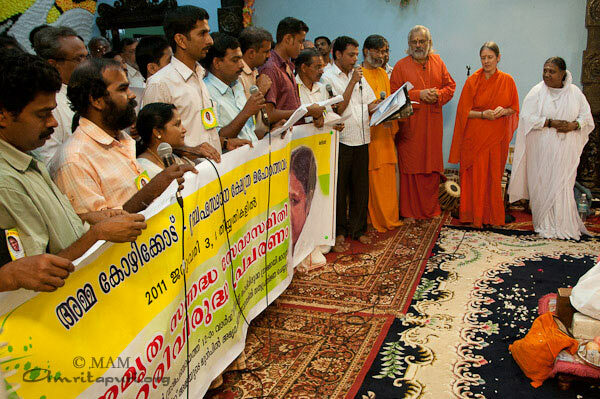 It is giving a house to live, clothes to wear, building a road to walk, providing water to drink, establishing schools to study and creating awareness about public health, cleanliness and hygene. 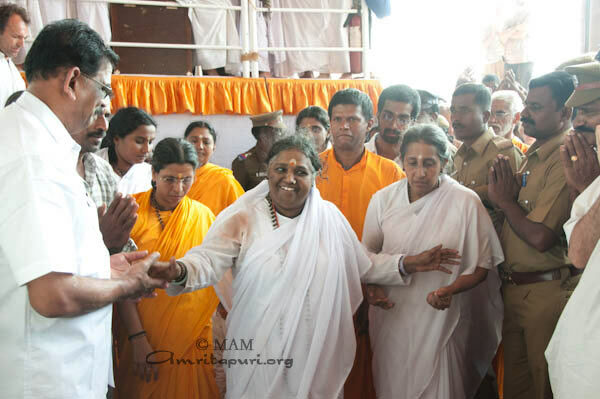 The one who is giving all these things is a true dharma devata (goddess of dharma). 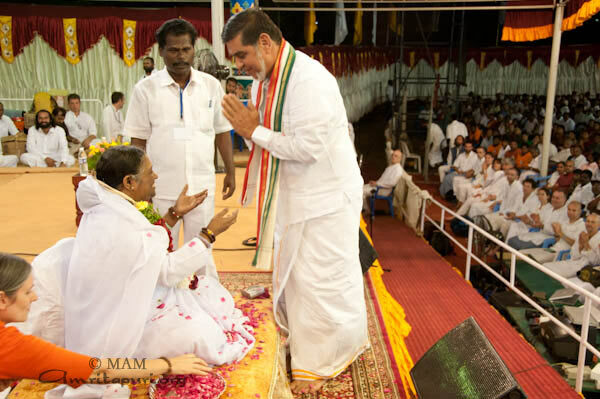 Amma, you have given support to the downtrodden in this area in abundance, yet I plead you to continue raising the standard of living of the poor by building houses, providing healthcare and educational support. 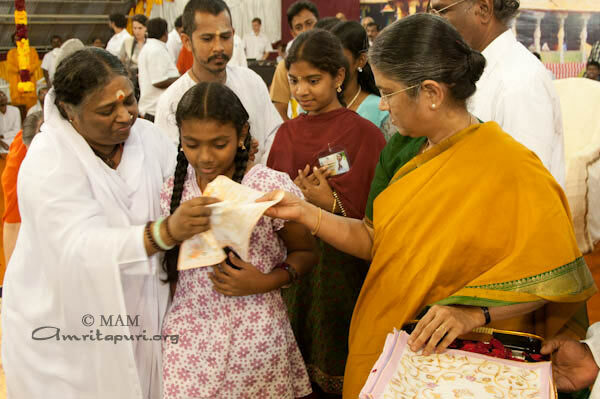 As part of the Amala Bharatam Campaign, Amma gave away handkerchiefs to all the children who came for darshan, asking them not to spit or urinate on the roads and public places. 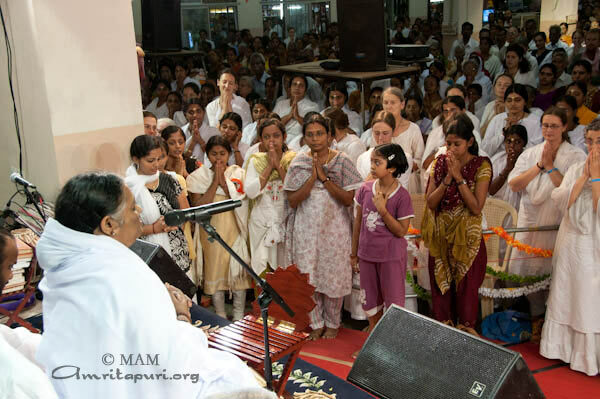 The evening continued with Amma’s satsang, bhajans, guided meditation and darshan. 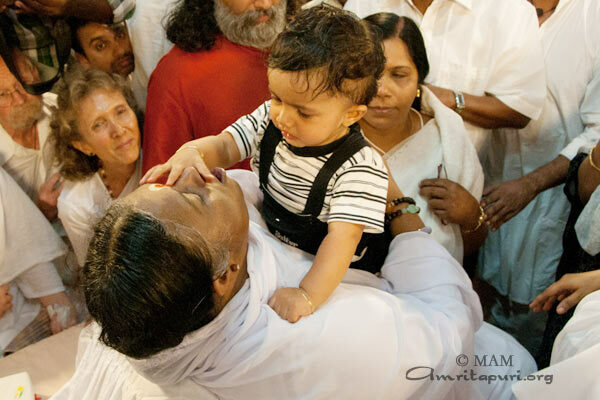 Even when Amma stood up at 7.30 am, the darshan had not yet ended. 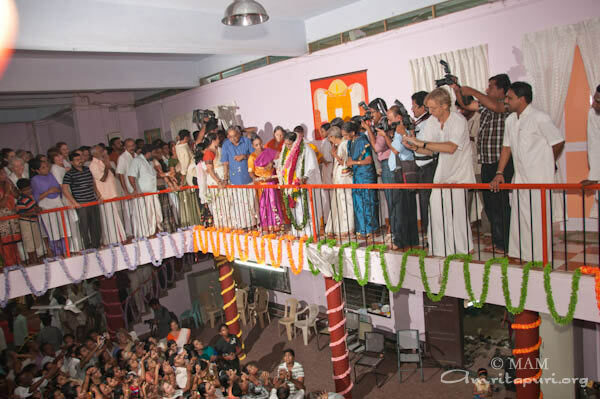 When Amma walked from the stage to her vehicle she called another 200 people for darshan who had just arrived at the venue. 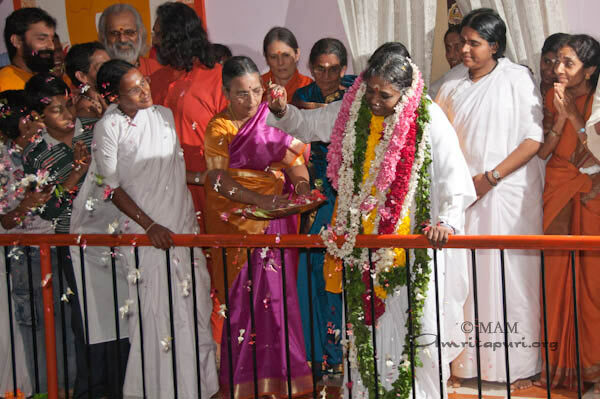 She then proceeded to give them all darshan standing on the steps to the doorway of her camper before leaving for Madurai. 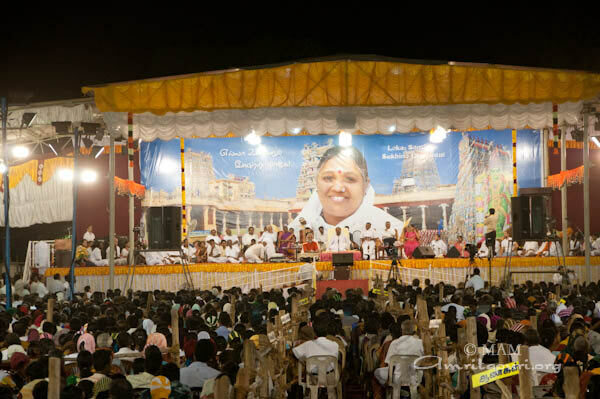 Amma held a public program in Tutucorin. 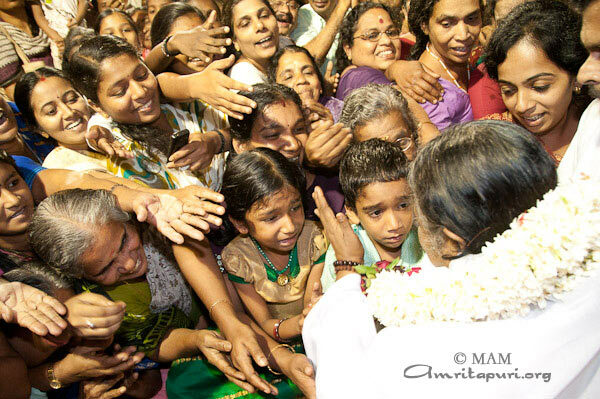 This was Amma’s first visit to the coastal city. 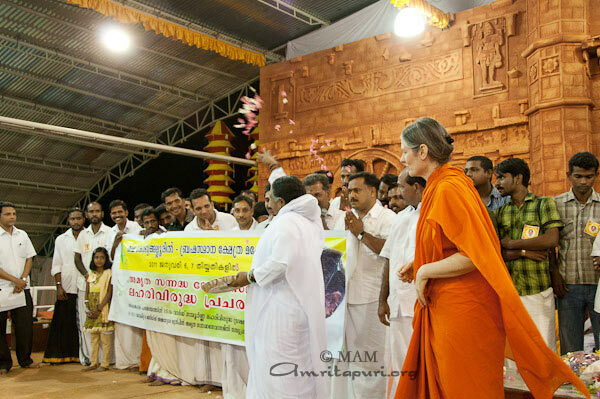 During the public function Amma launched the Amala Bharatam Campaign in yet another city. 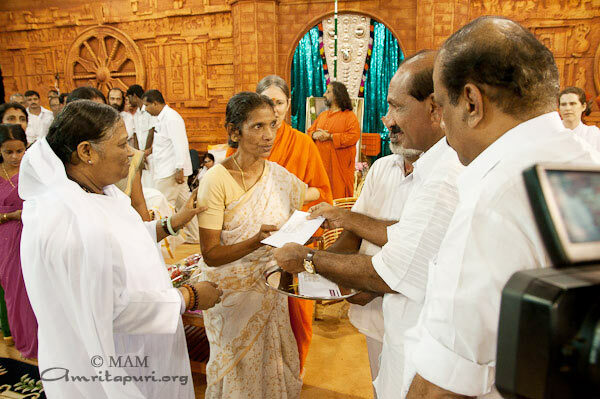 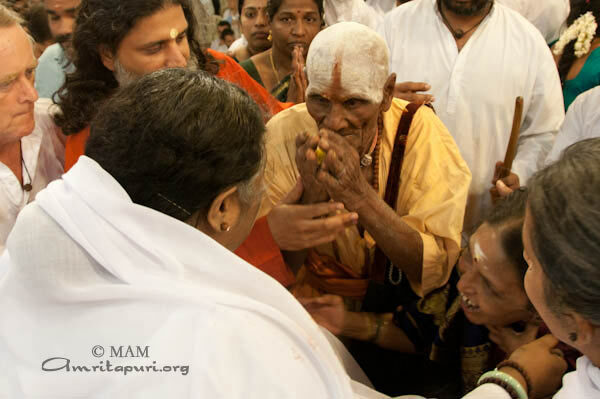 In order to encourage the people of Tutucorin not to spit on the ground and thus increase the spreading of contagious diseases Amma distributed handkerchieves to all the people who came for darshan. 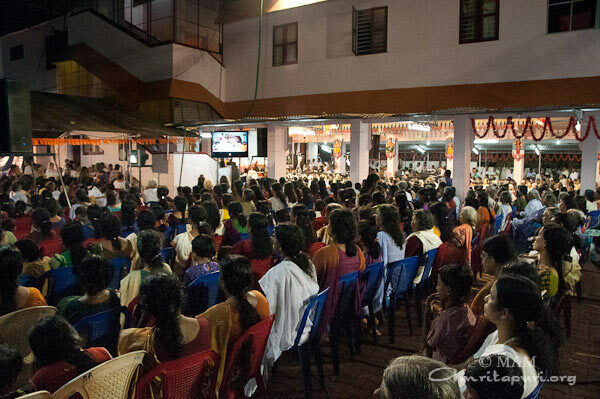 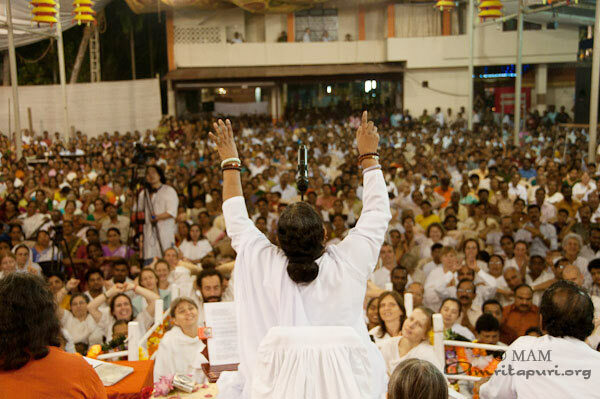 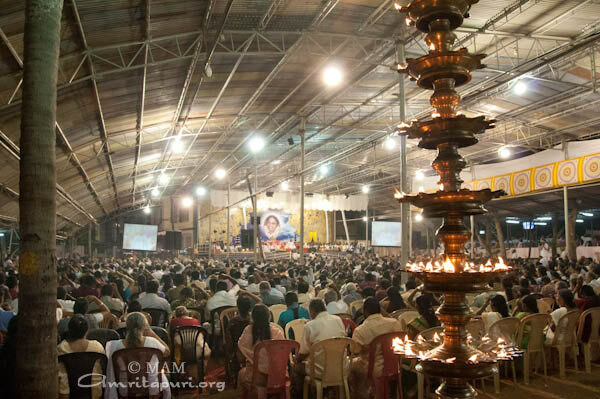 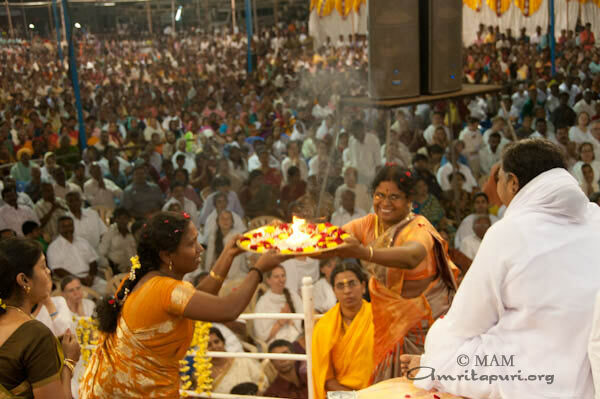 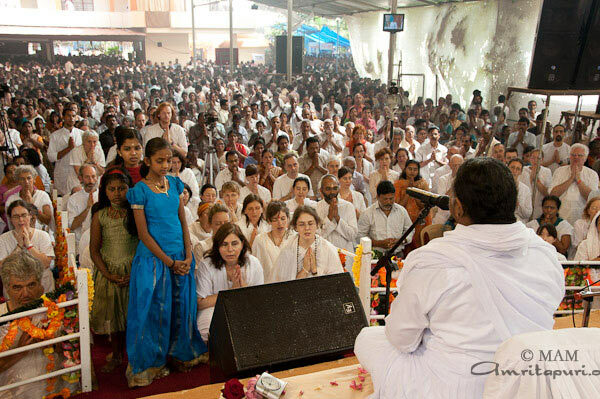 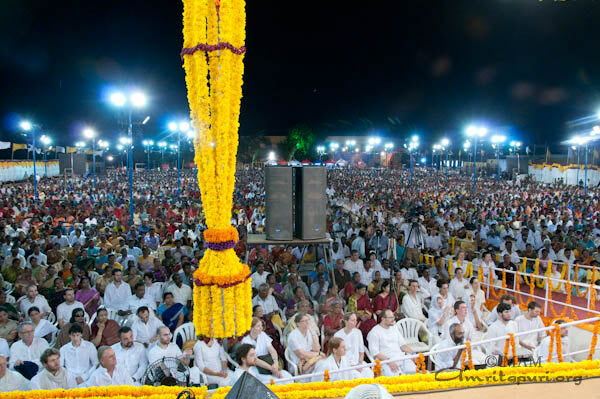 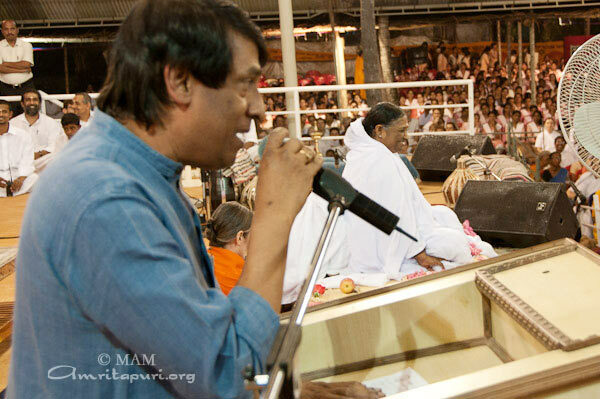 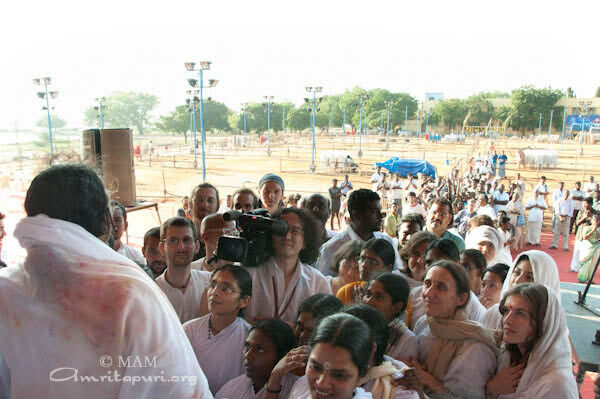 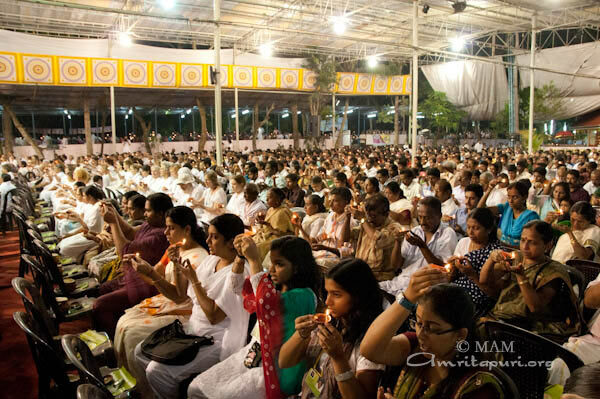 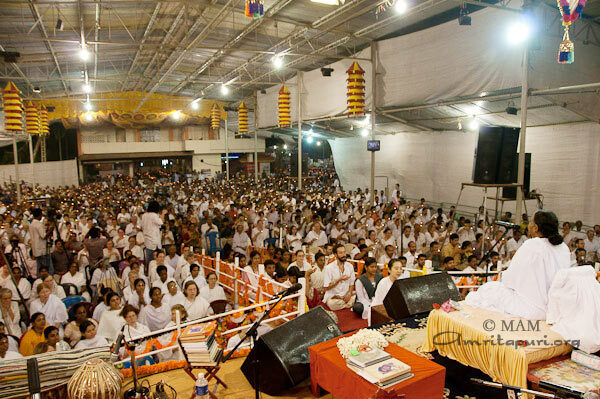 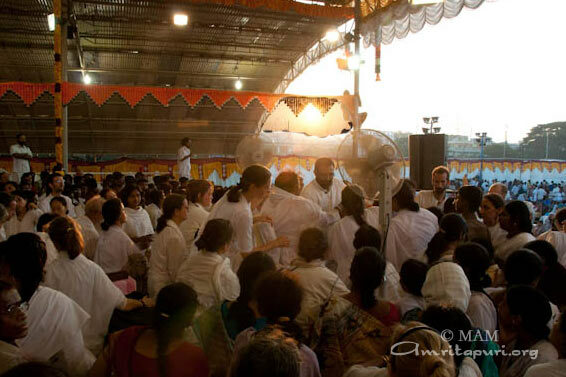 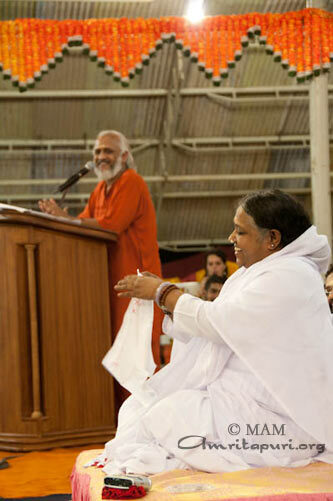 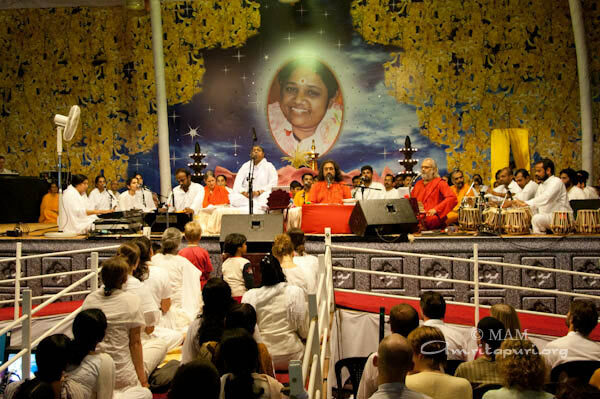 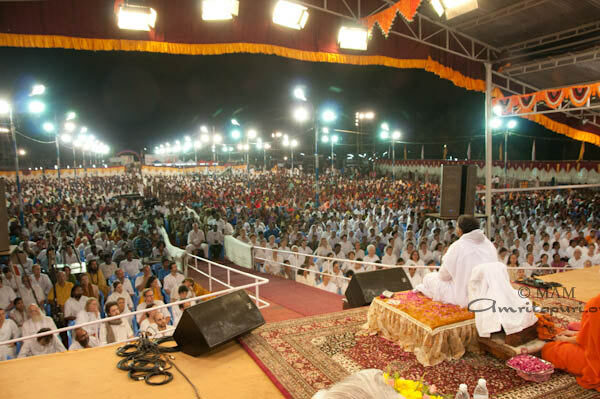 Amma’s satsang was translated into the local language Tamil. 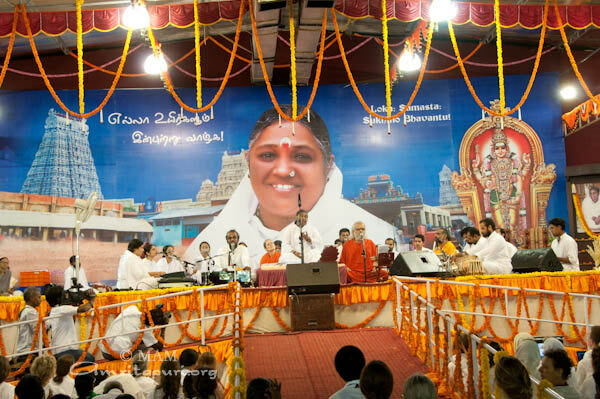 She sang only Tamil bhajans. 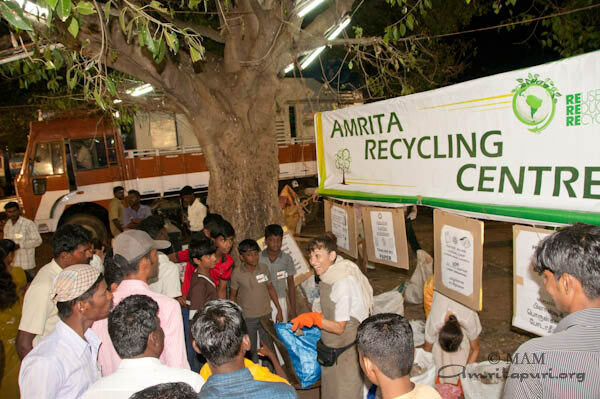 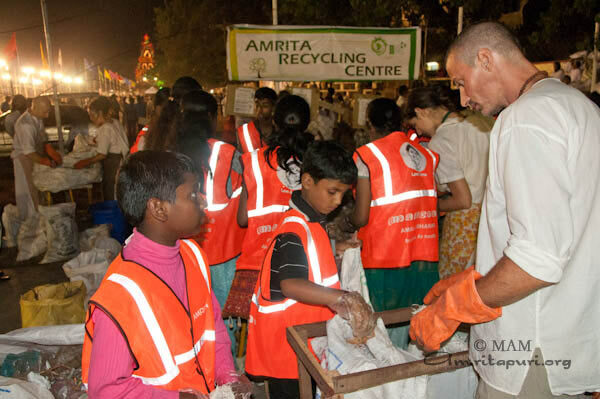 Leading by example, Amma’s Western devotees had set up recycling stations all over the program grounds to assist in the sorting and processing of the waste. 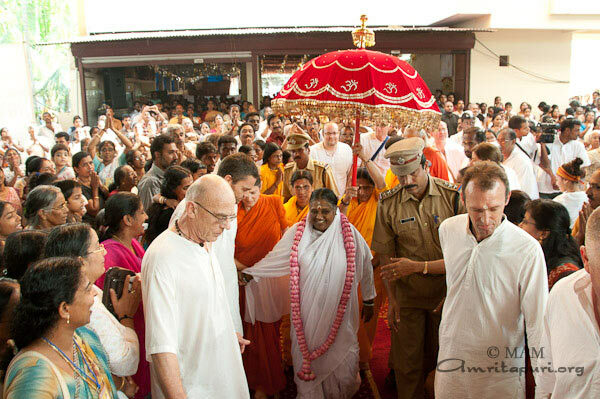 As darshan came to an end at 8.30 next morning. 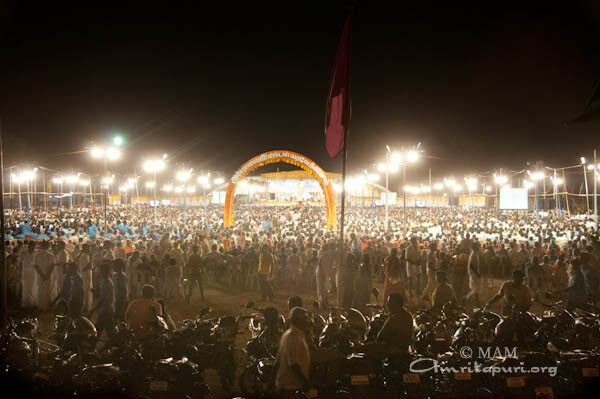 the compound was left clean and the hearts of the devotees filled with peace and love. 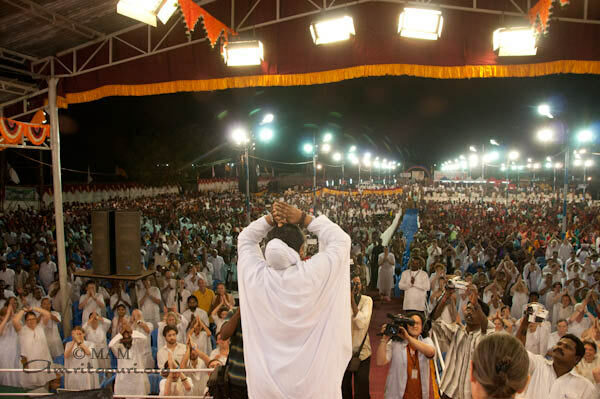 Amma began the 2nd leg of 2011 Bharata Yatra in the Kerala State capital, Thiruvananthapuram. 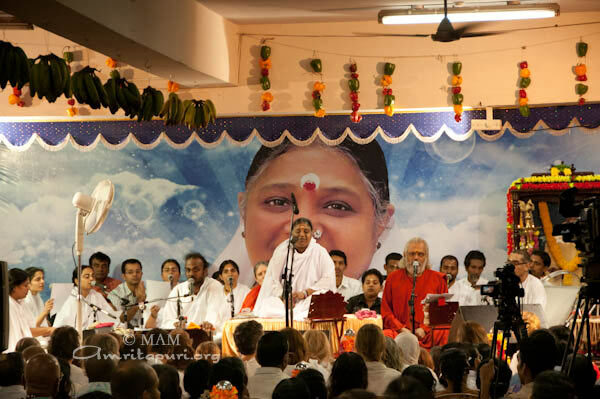 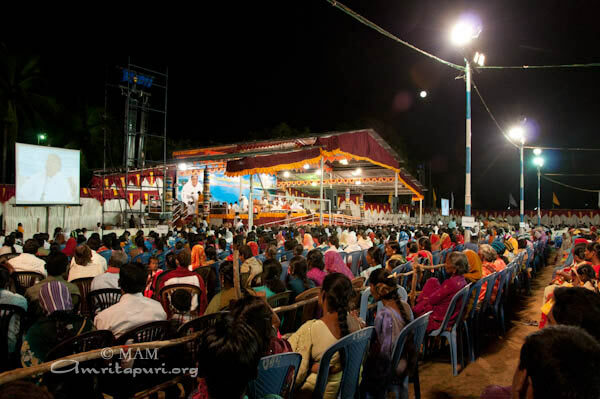 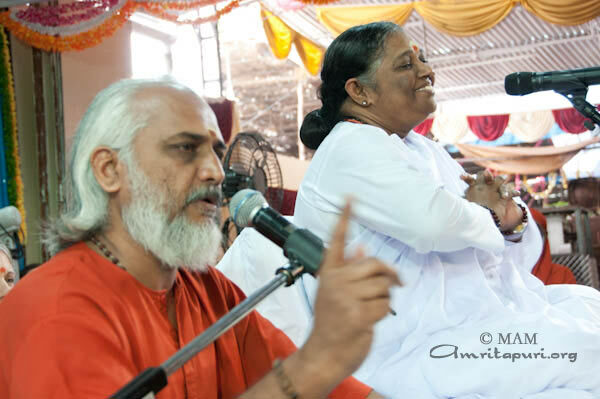 Two days of programs were held in Amma’s ashram in Kaimanam. 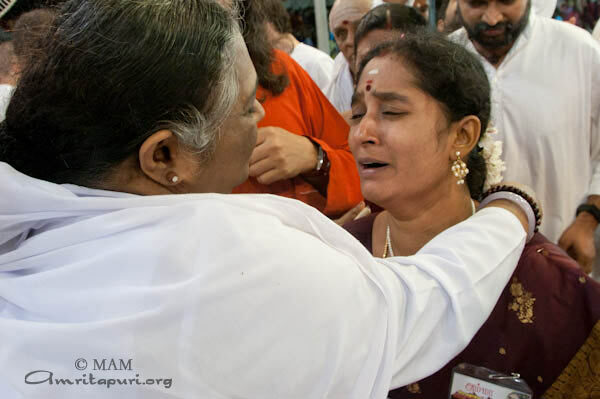 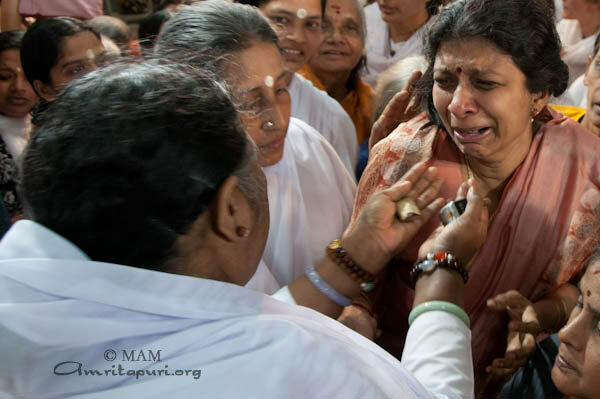 On the first morning of the program, before Amma began her bhajans she asked everyone to pray for the souls of the deceased and their grieving loved ones they left behind in the tragedy that took place the previous night at the famous Kerala pilgrimage center of Sabarimala were more than 100 people perished in a terrible stampede. 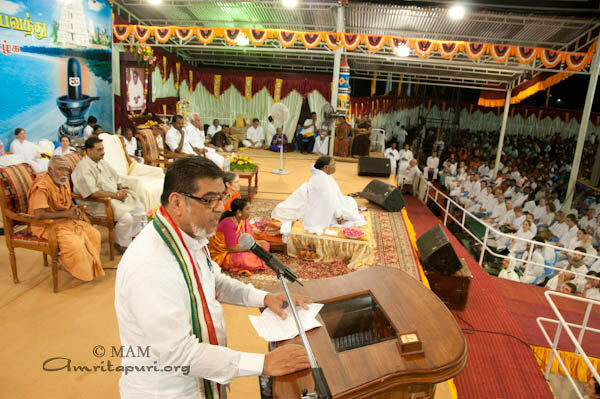 Being the capital of Kerala, several state officials and ministers were in attendance for the program and came for Amma’s darshan. 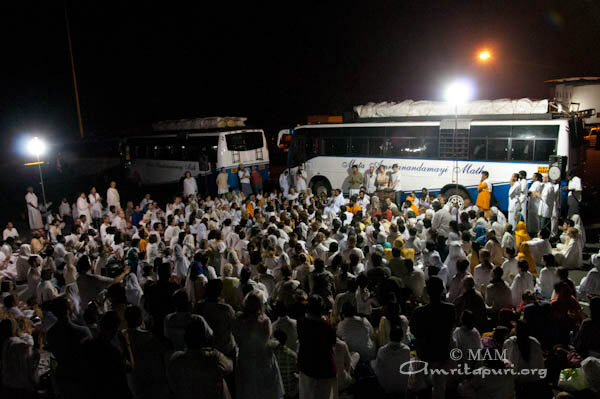 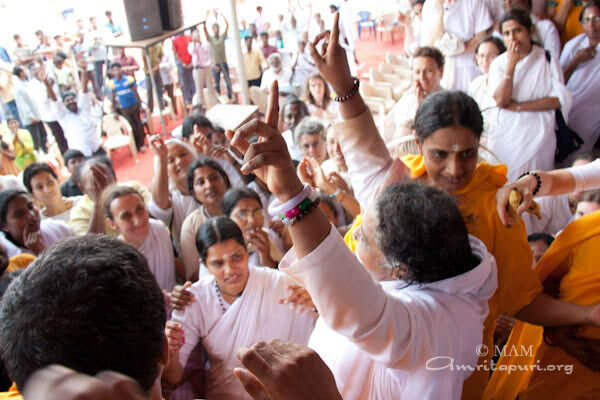 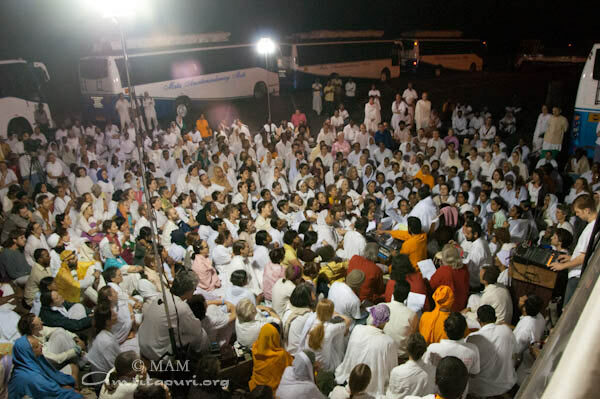 After two days of her programs, Amma travelled with the ashram caravan of 10 buses to Tutucorin. 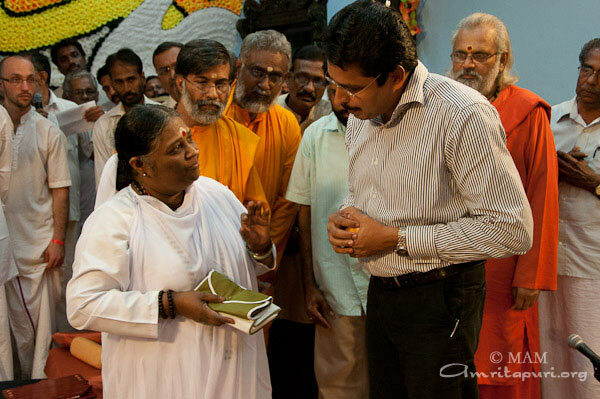 On the way Amma stopped at the Panagudi ashram plantation. 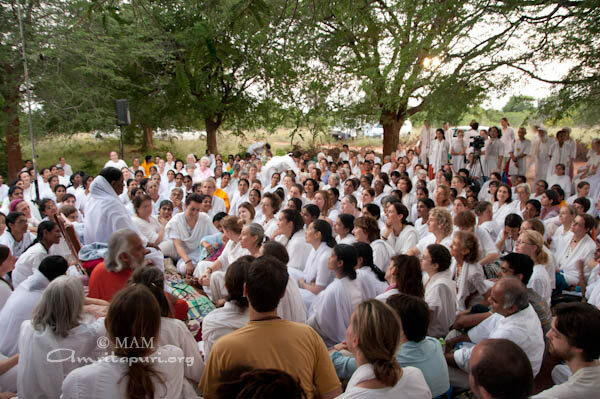 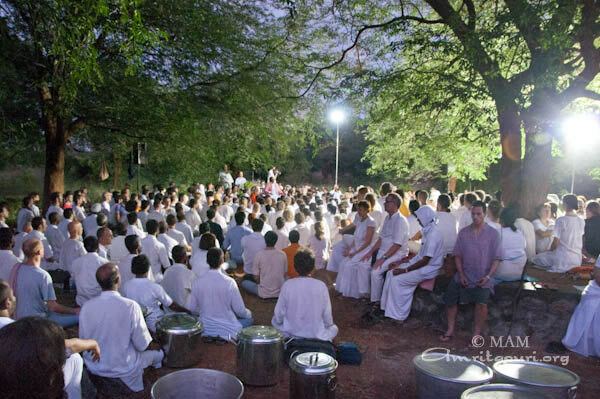 Amma sat with everyone for meditation, dinner and bhajans more than 1km off the road in the middle of the forest. 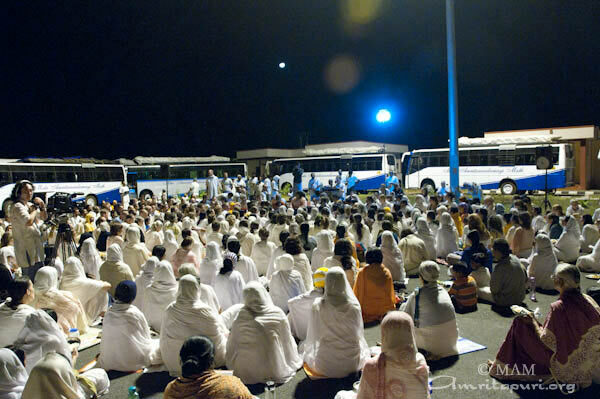 Beneath an almost full moon, Amma spent more than 4 hours with the tour group enjoying the beauty and serenity of the forrest and stillness of the night. 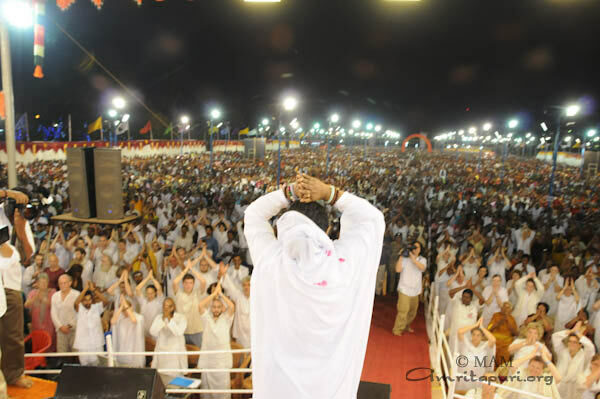 Swami Amritaswarupanda to visit Dubai and Abu Dhabi from 17th Jan 2011. 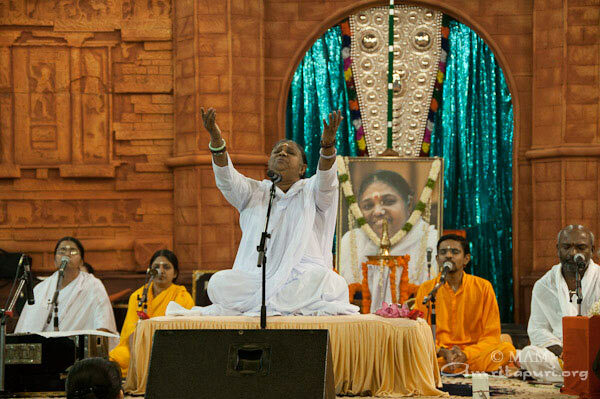 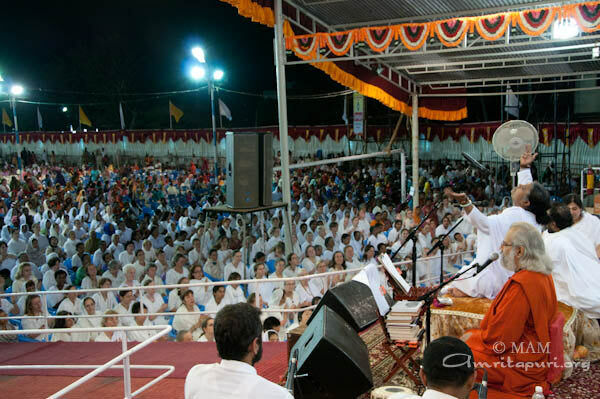 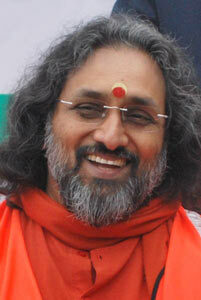 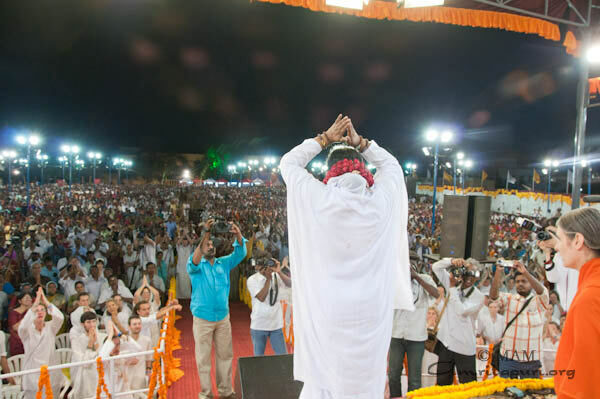 During his one week program, he will hold, satsang, bhajan, meditation and retreat at different places.